but don't worry, it's not that bad. Reportedly the coldest March for over 50 years and bad weather returns to our shores again. 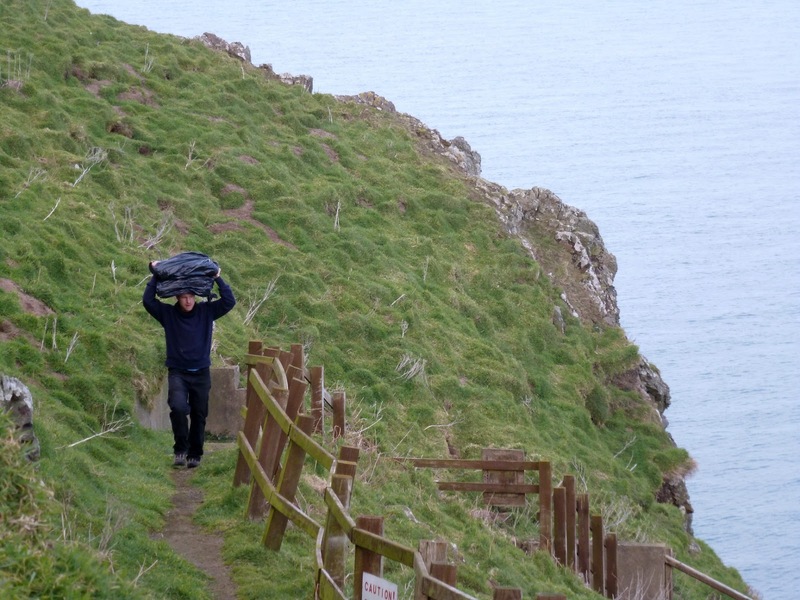 Today, despite persistent easterly winds, we had to get Will, our Hostel warden and two gas men out to the island in order to have any chance of being ready for our first visitors. Credit is due to all those who played a part in this. Andy and Ryan (the gas men) managed to get the boilers at the farm up and running and the population of the island has just increased by 25%. We now hope that the weather improves sufficiently for the first visitors to enjoy the Island as well. 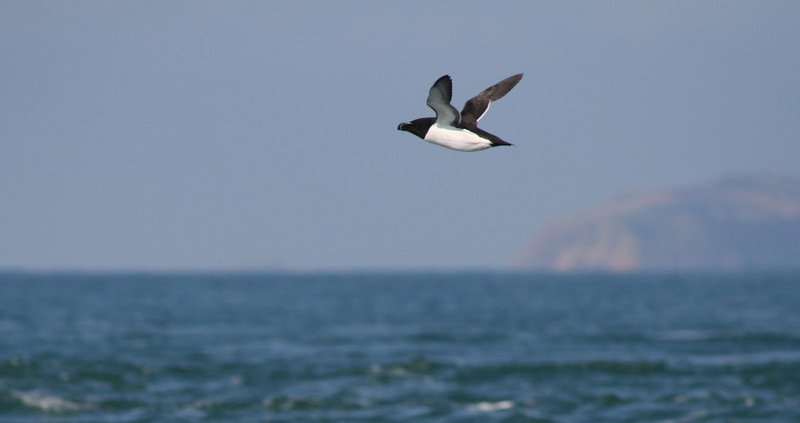 Manx Shearwaters have only been back from their wintering grounds off South America for a short while and are already getting eaten. Returning to the island at night is one way of reducing the risk but even that doesn't always work. 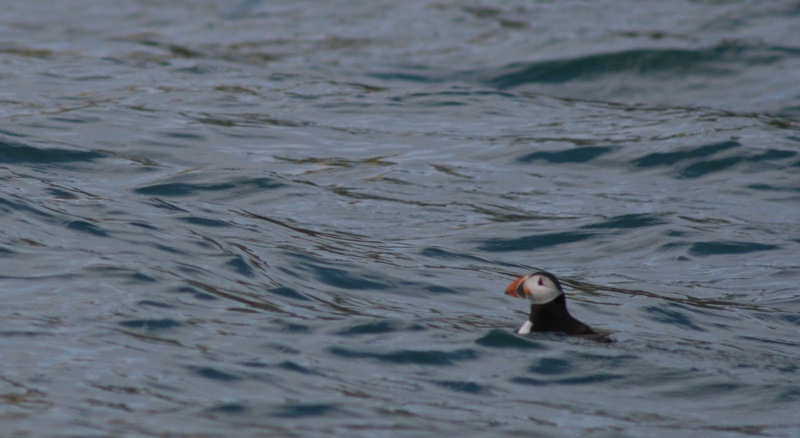 Puffin numbers are building up, especially in the afternoons, and there were over 3,000 just outside North Haven this evening. 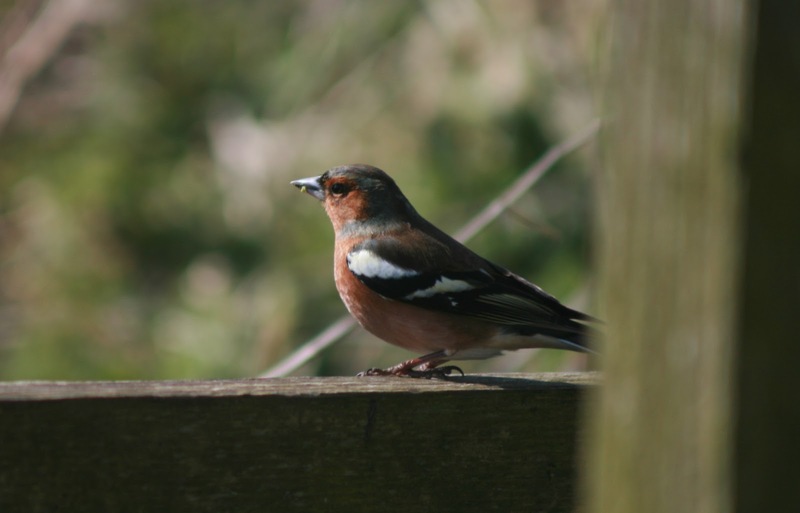 Migrants are passing in small numbers and include two relatively early Ring Ouzels, Red Kites, Sand Martins, chiffchaffs, Robins and Wheatears. Wrath of the Weather Gods? The last 24 hours were a period of miner disasters and we are wondering what we have done to anger the weather gods. It all started yesterday evening with a box of Tunnock bars which got nibbled by mice and ended with the gas running out at North Haven so we couldn't have a bedtime drink or bake our lovely wholemeal bread. Under normal circumstances we would have taken the tractor up to the farm to get new gas bottles but it was blowing quite a hooley (unfortunately in this case meaning a gale force 7, whereas in its original sense a "hooley" or "hoolie" is an Irish term for a loud and boisterous party or a celebration) and lashing down with rain so we did not fancy the ride.The strong winds also meant that we had to postpone the arrival of our first group of volunteers, which ultimately means more work for us. The next morning, after a night of listening to the rain hammering against the windows and feeling the entire house shake (the latches to the attic fly open whenever we open the front door) we got up groggy only to find that the uncooked wholemeal bread had overflowed its container and was slowly but steadily covering the entire inside of our oven. After cleaning the mess, fearless Ed finally set out towards the Farm wrestling the natural forces - and all without having had a cup of tea. After a very cold and long journey, our tractor crawls at a snail's pace, Ed arrived safely back at North Haven with the long awaited gas bottles. So in theory this could have been the end of our woes but some days just have it in for you. The next thing that went wrong was that the unruly dough just would not cook - no matter how long we left it in the oven. In the end we ate it semi raw with our (by now cold) fry up at 1300h - what a breakfast! Then, just as we were sinking satisfied back into our chairs with a belly full of beans and mushrooms the wood burner did a smoky burp and surrounded us with a grey cloud. Immediately we jumped to the rescue and opened a window. A lovely fresh breeze got rid of the smoke but unfortunately also blew a painting off the wall and shattered the frame. 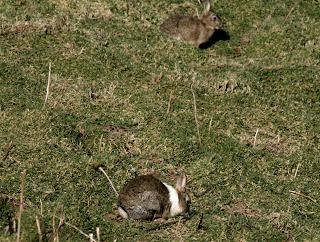 We had just cleared up the pieces when we received a phone call from Richard Kipling, our field assistant, telling us that he was very sorry but had found a permanent position and wouldn’t be able to work for us this year. Shortly after, our assistant warden Nia called to say that the wind had ripped off a window at the farm and that she was patching it up with wood. 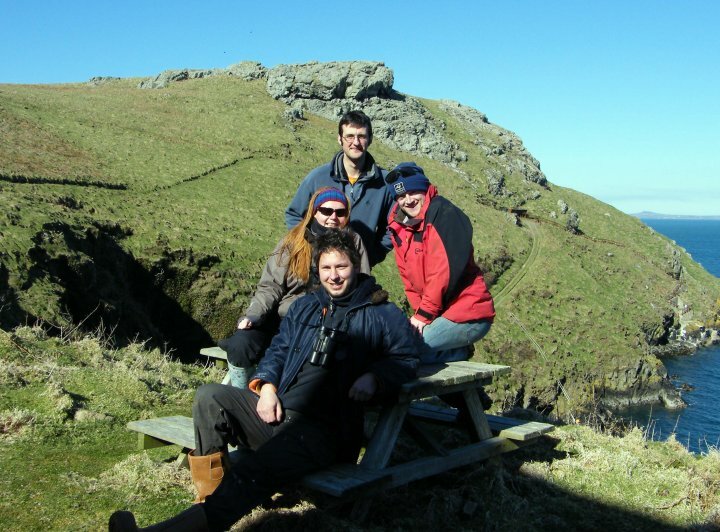 A huge thanks to Eddie, Bee and Nia for their great hospitality on Skomer over the last two days. 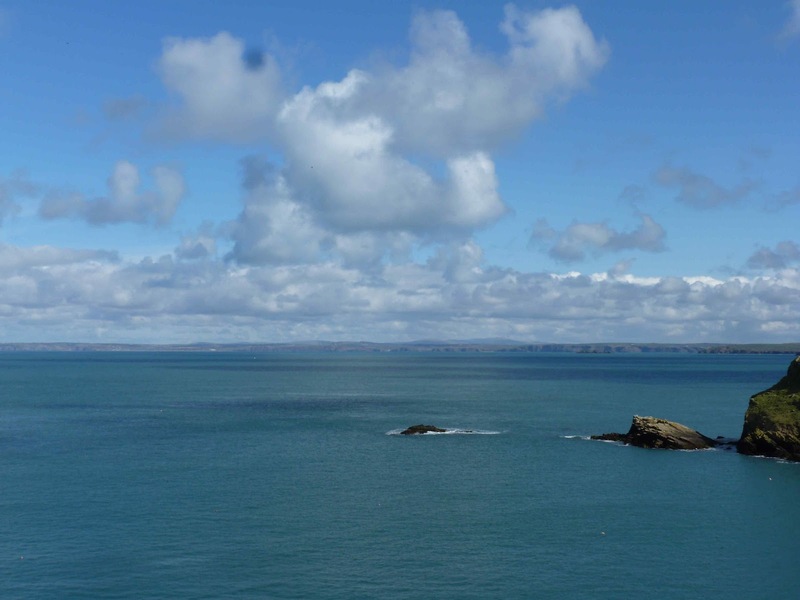 We took the opportunity of the wonderful settled weather (and seas) to run a couple of errands out to Skomer and Skokholm (where a huge party of volunteers are working all hours to build and repair the jetty and buildings for the coming season). 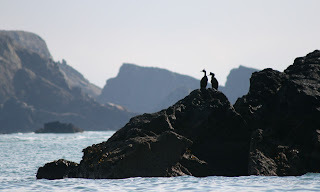 Like so many visitors to Pembrokeshire we have visited Skomer often on day trips, but have never got our act(s) together for an overnight stay; we decided to set this right. Spring feels a bit of an on and off affair on the mainland at present (we had the best part of an inch of snow near Rhayader on Friday night, and hail in Milford Haven this afternoon! 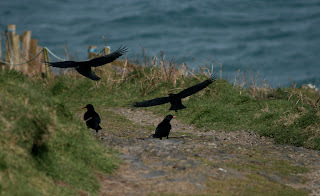 ), but the weather on the Islands really IS sunnier! 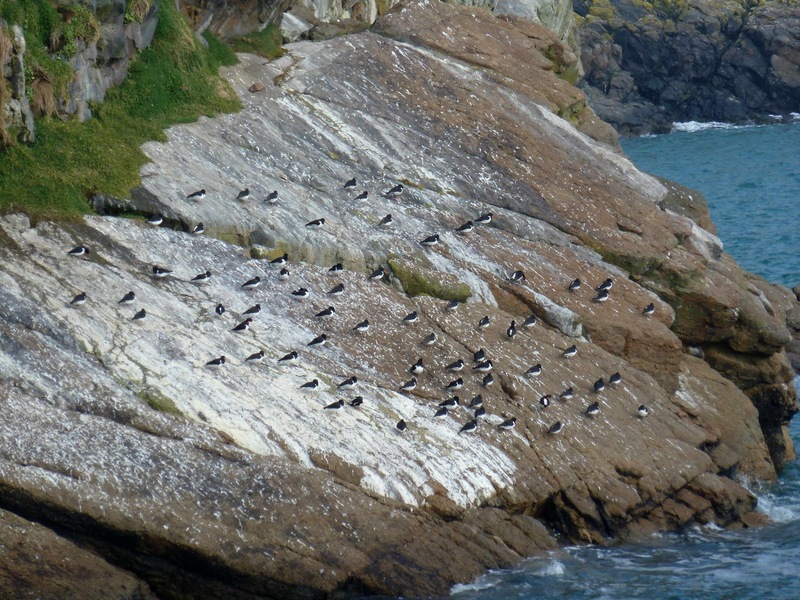 And the sea birds are coming back already: big rafts of Razorbills near the islands, and smaller groups out to sea, and a raft of 200+ Puffins just outside North Haven last night a real sign of things to come. 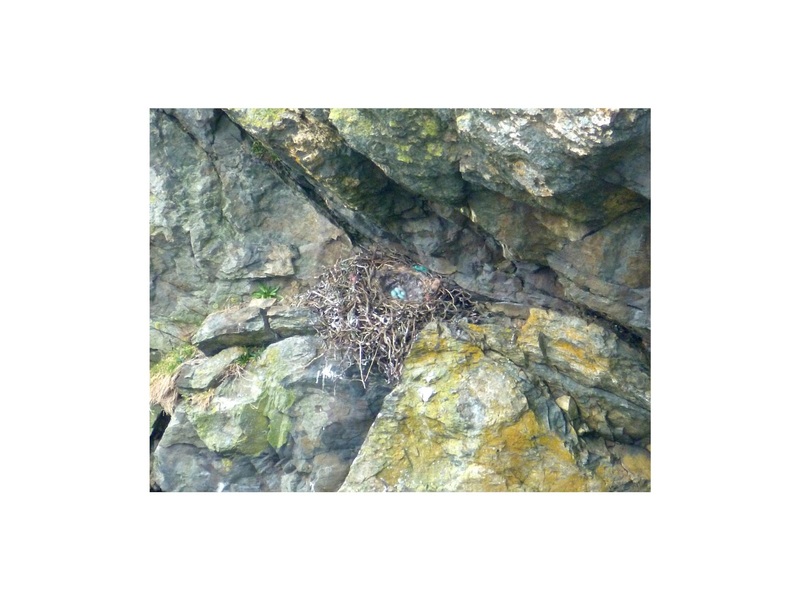 And, this morning, we saw the first Puffin of the season on the Neck, just across from the landing stage, inspecting potential burrow sites. He didn't stay long, before flying back to sea, but numbers should build up daily from here. And three Manx Shearwaters heard last night shows that they are starting to return, too. 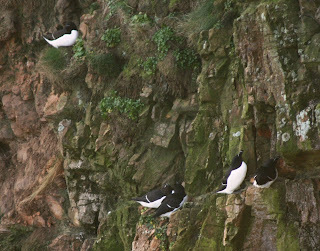 On the Island itself there were good numbers of Razorbills, Guillemots and Kittiwakes on the cliffs this morning, but last night there were none: just pairs of Fulmars; a real reminder that, until egg-laying in a few weeks, the birds will commute on- and off-shore every few days or so. Lots of seals in North Haven, singing mournfully as they basked on the rocks. Ashore, the Island still looks a bit winterous (lots of dead bracken etc; a single Chiffchaff the only migrant) but, underfoot, you can already see the Scarlet Campion and Bluebells starting to sprout: roll on May! Yesterday evening Moorey Mere was alive with mating Frogs and Toads: the frogs' singing (if that is what you call it) was audible from the path 25+ yards away. And the streams are all still very full after the winter rain: this morning we saw two Water Rails in South Stream. We spent much of this morning on a voyage around the Island, so that Eddie, Bee and Nia could get used to the Skomer inflatable boat, learn some of the tricks and challenges of the sea, and spy out seabird colonies that cannot be seen easily from the land, but will need counting in May when the Whole Island Count takes place. This is also a good way to look for the Peregrines: there is clearly already a pair on the North coast near the Garland Stone. Conditions were pretty good (especially for March! 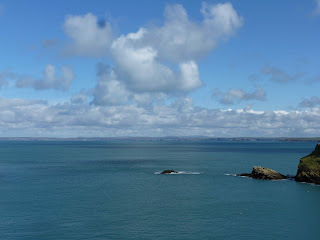 ), but you can get an idea of the BIG swell that we encountered as we went around the Mew Stone! 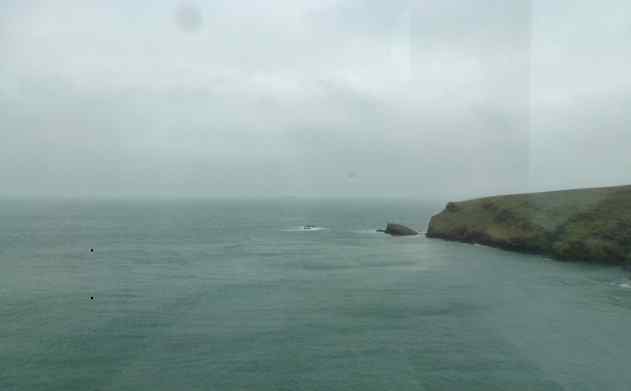 By contrast both Little Sound (between Skomer and Midland Island) and Jack Sound (between Midland and the Deer Park) were flat calm: we got fantastic close views of Porpoises, and Gannets diving around them. 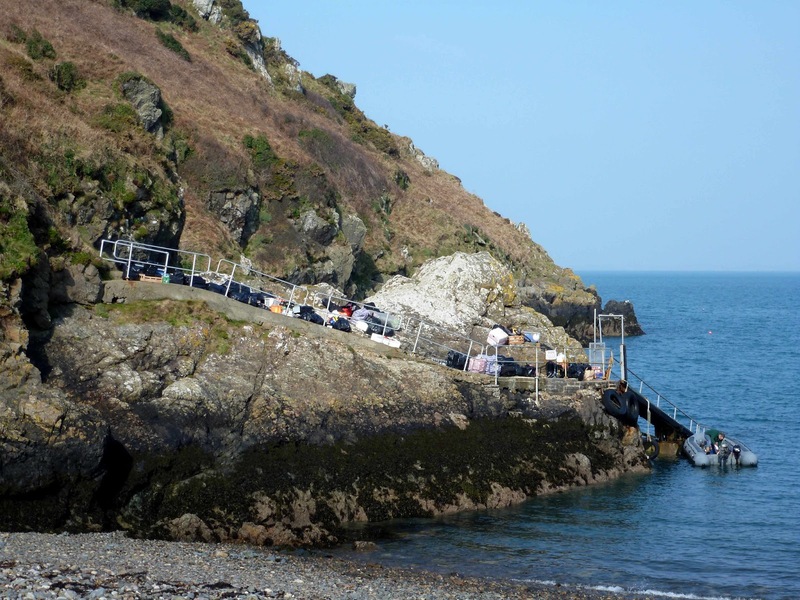 It is a big job opening up an Island for a season of visitors: if you have read some of the earlier posts on this Blog you will have an inkling of the work just to bring luggage, food and equipment ashore. But this gives little idea of the cleaning, sorting and maintenance work that has gone on in the last two weeks, and the behind the scenes work that takes place before the Dale Princess arrives first thing in the morning, and after the last boat leaves in the evening. Good luck for the Season, see you all again soon! Well with the cold snap over for now we can stop huddling together for warmth and continue our intensive training with Chris. Actually, if the weather holds, Chris will be leaving us tonight, to make sure he does get back and onto his train up to Orkney in a couple of weeks time to start his new job. We thank Chris for all his hard work and banter. 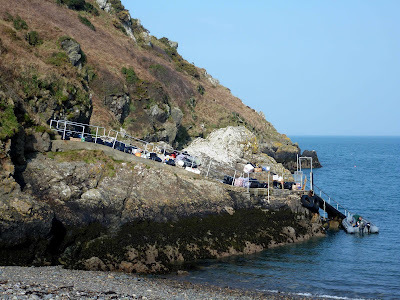 Since our last blog post we have been learning about the infrastructure of the buildings on the island, going over all the monitoring tasks and have started the huge cleaning job needed to get the place ready for the first volunteers and guests. We moan but the cold snap was actually quite fun and you don’t get snow and ice on Skomer every day. Last Saturday, during fine weather, many auks moved in towards the islands again (which they apparently do on a roughly three day cycle at this time of year). In North Haven alone we counted over 500 Guillemots and 365 Razorbills sat on the cliffs and the water. 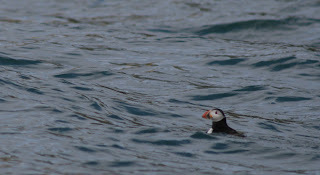 The rafts on the water included our first few Puffins. A Red Kite drifted close over our heads and there were a few small migrants about in the form of Chiffchaffs and Goldcrests. 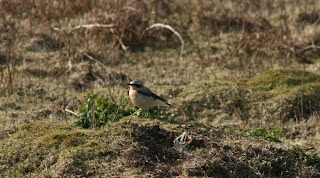 We saw our first Sand Martin on Sunday and a Black Redstart was briefly present at the farm on the Monday. A migrant male Chaffinch yesterday. The shadow bird (just my bad photo of a Raven really). We are learning about the local 'wild' life everyday. These Rabbits with white stripes are apparently called Dutch Rabbits. Have you ever had to move house? Yes, then you probably know how tedious and tiring it is to move heavy boxes full of books: banging into the door frame as you go - down the stairs, narrowly avoiding a slip - along the pavement, skirting the dog poop - into a van, mind your back! and then everything in reverse at the place of destination. Now imagine moving into a multi-storey building and the lift is broken - and to make things a bit more interesting someone has spilled grease onto the stairs. Now you can imagine how we felt on Saturday when we had to move all of our belongings down onto a very slippery jetty at Martins’s Haven and up 80 uneven and just as slippery steps on Skomer Island. To be honest, we probably would have resisted buying the 25kg sack of rice and the 20kg of potatoes, not to mention the box of Tunnock’s bars or the family pack of toothpaste, and we might have even settled for the small bag of flour and abstained from beer and wine if and only if we had known how strenuous the Skomer take-over would become. The trouble was that our little inflatable boat - which could have landed on the beach, where the tractor can get to - broke that very morning so that we ended up using the Dale Princess. 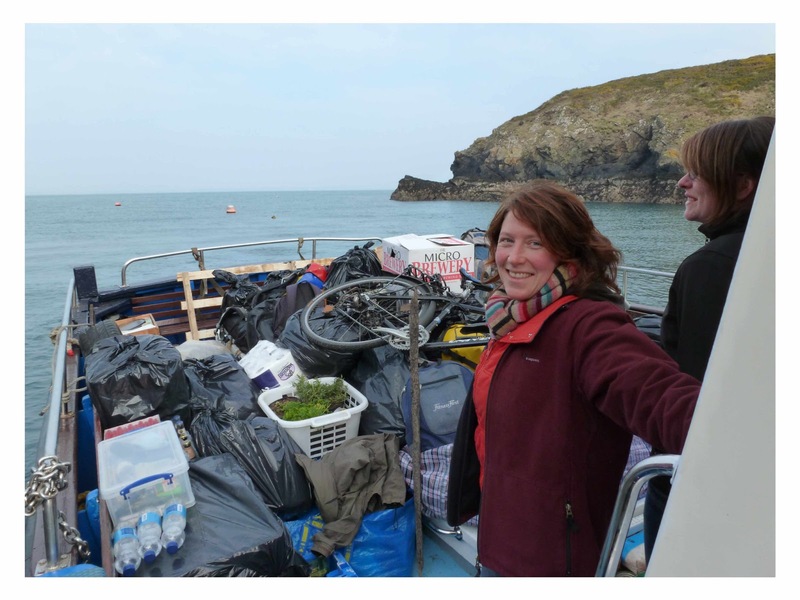 We are very grateful that John Reynolds came to our rescue and made moving to the island, that Saturday, possible. We worked like Sherpas till sunset and managed to get everything into the house that night. Since then our days have been filled with endless wonders: fire alarm system, septic tank, generator, solar PV ... but luckily everything is working and after a bit of spring cleaning we are feeling at home already! 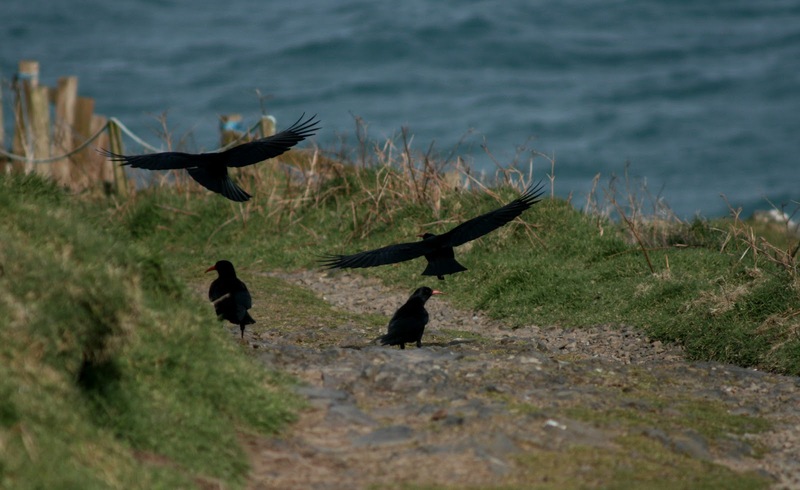 Of course there is more to Skomer and the Warden’s job than just buildings and maintenance, there’s the absolutely fabulous wildlife too. And we have already been in for several treats. On Monday the 4th we heard the very first Manx Shearwater for the 2013 season and listened to the eerie call of a hunting Short-eared Owl. The next day we did an all island recce and literally looked at every nook and cranny of it. 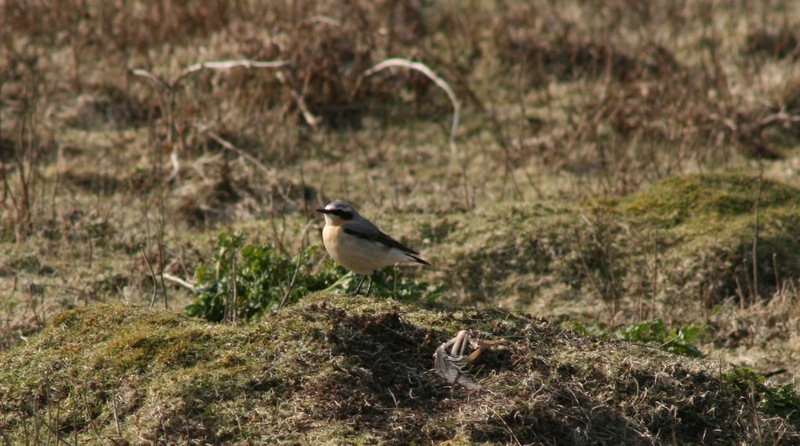 Ed spotted a Northern Wheatear opposite the Mew Stone and as there have only been four earlier Skomer records since 1969 it was quite an exciting observation. Chris spotted a Chiffchaff in North Valley later that morning and at 1300 we saw four Pink-footed Geese flying from the North Pond towards the mainland. Another good find was a Raven’s nest with 5 lovely blue eggs in it.